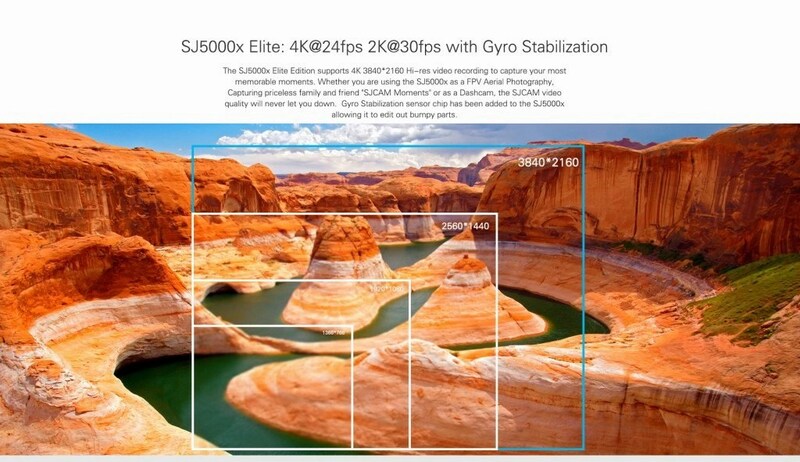 SJ5000X Elite Edition has been realeased on November 2015, and it has a lot of new features upgraded from SJ5000+, as 4k video resolution (interpolated) @ 24fps and 2k @ 30fps, a very good 12,4Mpx Sony IMX078 image sensor, Novatek 96660 chip, wifi and Gyro stabilizer. Important hardware and quality improvements, and correction of bugs (SJ5000+ used to freeze often), that allow us to say it is probably the best budget action cam of early 2016 around 100$, together with Gitup Git2. Subscribe to the new facebook group dedicated to SJ5000X click here. Or join our facebook group Action Camera World. This action cam has the new 12.4MP Sony Exmor IMX078 image sensor and a Novatek 96660 chip that allow this cam to record interpolated 4k videos ( 2880×2160) with a frame rate of 24fps, 2k @ 30fps or 1080p FullHD @ 60fps. It mounts a gyro stablizer for more stable and ssteady videos without annoying vibrations, even in sport situations. It has a 2″ rear screen where you can see live what you’re recording, cheange settings and playback yur files, and wifi. Sony Exmor IMX078 image sensor used in this action cam has a sensibility of 1437 digits and could theorically record 4k videos with a resolution of 4000 x 3000 pixel at 42fps, but Novatek 96660 chip can’t reach this numbers, restricting the cam to record interpolated 4K @ 24fps videos. This is the same sensor used on Firefly 6S and in the Pentax Q photo camera. Gyro Anti-Shake stabilizer makes this action cam recommended for sports videos, like mountain bike, ski, motorbike, or with drones. From firmware version v1.25 the gyro works quite well and absorbes a lot of vibrations. You can see the difference from a non-stabilized video even shooting a video walking with the cam. When you try a cam with stabilizer you won’t buy one without it anymore. As we said, SJ5000x doesn’t reach full 4k resolution of 3840×2160 but 2880×2160 that stretches (or interpolate) up to 4k, as it happens for Firefly 6S and Gitup Git2. The lens is a wide angle that reaches 170°, and videos are originally shot with this unique resolution, then electronically, cropping the edges, the cam can reduce the field of view at your choice from the list above. Obviously in this way the frame is narrower, but in this way you can avoid barrel distortions typical of the fish eye of wide lenses. This is very useful when you need to shoot videos or pictures of places with straight lines or when you don’t need a large field of view – it is like zooming digitally. The maximum resolution for pictures is 12 MP (4032 x 3024 px). SJ5000X has also these features Time Lapse – photo lapse and video lapse -,Self Timer and Burst Rate, 3 to 10 pictures in a second. Videos are recorded in the .mp4 format with .h264 codec. 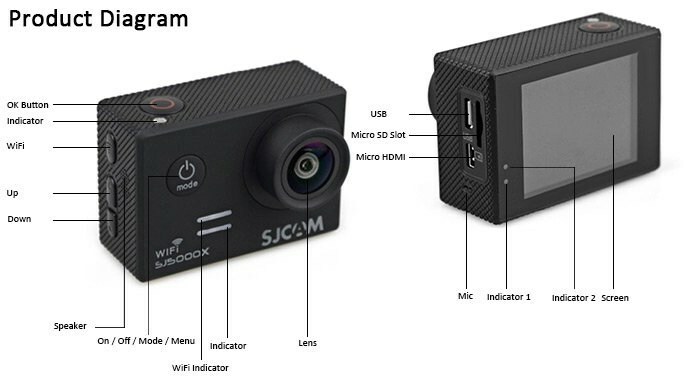 As usual in SJCam action cams, SJ5000X has a 2″ screen, where you can see what you are recording, change settings and playback videos and pictures. This a really useful feature for beginners but also for action cam experts if they use it to take pictures or in their hands, in fact you can see live what you are recording and choose the frame correctly. The cam records on micro sd cards and now we can use 64 and 128GB TF cards. Talking about connectivity, SJ5000X has built in wifi, so you can use the dedicated App for iOS and Android to command the cam from smartphone or tablet, to start/stop recording, shoot a picture, change settings, watch live the recording, and playback videos and pictures. The cam has a micro USB port to charge battery and to connect it to the PC, and micro HDMI port to connect it to a TV or monitor. It uses the classic 900mAh SJCam batteries for a maximum recording of 1h20m at 1080p 30fps. Dimensions of the cam are 61×42.4×25 mm anda weight of 74g including the battery. If you use tha cam with the included waterproof case, you can shoot underwater videos and stills. Buttons are soft and easy to press. As we always say, it’s not enough to read all hardware components, features and functions, what really matters in the end is the video and photo quality. Here you’ll find a test we made with the SJ5000X, than how it is compared to Git2, Elephone Explore Pro and Sony AS200v, and than a video that explains how the menu works. As we said before, with firmware version v1.25 things got very interesting. Gyro stabilizer now works pretty well, colors are natural – good greens for the plants and blue for the sky – exposure changes are well managed even in back light, pictures are beautiful even in difficult lightings, shaded areas are well exposed, audio got really better (but still not good as git2). Here is a comparison video among SJ5000X, GITUP GIT2, ELEPHONE EXPLORER PRO (all of them has a Sony sensor, Novatek 96660 chip, gyro and cost around 100€) and SONY AS200v (around 200€). As we can see, there’s not a clear winner – Elephone is clearly the loser, but it’s a brand new model, probably things will get better with new firmware updates as it happened for SJ5000X and Git2 -. Very good stabilization for all of the 3 remaining, colors are natural, vivid, real, exposition is well managed, in shaded areas probably the best is the SJ5000X, it produces clear videos even under the trees with low light. The sharper videos seem to be the ones recorded with Sony and SJ5000X. I think the best pictures are the SJ5000X ones, they are always well lit and with vivid and natural colors, even in back light. In the first version of this post at the end of 2015 we said this cam had a lot of problems and that it was not such a good choice, for instance the gyro wasn’t working properly, colors were reddish, audio had a very low quality, pictures were flat, reddish, dark and not sharp. With the latest firmware updates, above all the last one, v1.25, almost all these problems were nicely solved. Gyro stabilizer now works pretty well (see videos below in the article), colors are natural – good greens for the plants and blue for the sky – exposure changes are well managed even in back light, pictures are beautiful even in difficult lightings, shaded areas are well exposed, audio got really better (but still not excellent as git2). Besides there are a lot of new options in the menu, like the volume setting in the audio section, shutter speed and more. We can now say that SJCAM worked hard to get the best from its good hardware. So now we feel to suggest this cam, as we did for the Gitup Git2. It has a lot of winning points, good video quality, excellent photo quality, (interpolated 4k@24fps), 2k@30fps videos, 2″ rear screen, good gyro stabilizer, a lot of accessories, a very good price (119$ from gearbest, 150$ on Amazon), many options. Probably the only defect of this cam is still the audio, low volume althought you have 3 volume levels in the menu now. Its competitors are Gitup Git2 – same video quality and similar hardware, good audio, external mic, remote control, slightly cheaper – and Xiaomi Yi – good video quality, cheaper, but has no accessories, no waterproof case, no screen. You can also check our article about the best action cams of 2016. Do you have SJ5000X? Leave a comment!